WriteMaps.com is a handy web-based tool for planning website structures in a mind map -like format. The tool allows for storage and working on the designs in collaborative fashion. I have been toying for quite a while with the idea that mind maps could be automatically converted to Midgard -compatible site structures, and the JSON format provided by WriteMaps seemed to support the idea. I’d love to make this a bit easier, but that would essentially require WriteMaps to provide an API we could hook to. 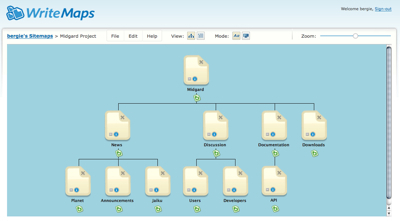 Get the json_to_structure.php file from Midgard SVN. 13 November 2005. 1 minute read. DENIM is an interesting, BSD-licensed desktop application from University of Washington. 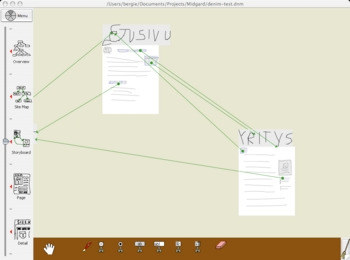 It allows web developers to sketch site and page structures easily with a stylus. Pages can be interlinked, and contain operable components like forms. 02 March 2005. 1 minute read.